Successfully Added Numeric Keypad - 22 Keys, Blue Mechanical Key Switch, Plug And Play, USB 2.0, For Windows, Android, Linux, iOS to your Shopping Cart. This portable numeric keypad provides calculator-style efficiency for entering numbers into your laptop or tablet PC. 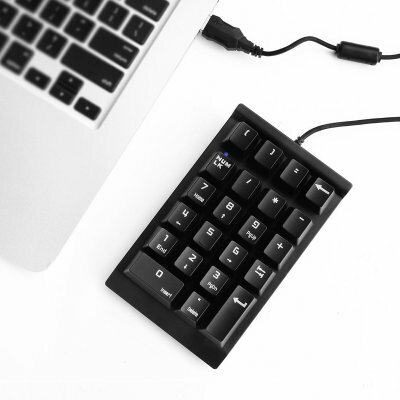 Featuring a USB 2.0 interface, this 22 key number pad can be easily connected to any electronic device out there. Simply plug it in and you’ll be all set to enjoy the high efficiency provided by this number keypad – bringing along great productivity and reducing your loss of time when engaged in calculations on your laptop. This numeric keypad is the ultimate electronic gadget for engineers, financial workers, and accountants who often need to enter long sequences of numbers quickly. Compatible with the majority of Windows, Android, Linux, and iOS systems, this number keypad works with most computers, laptops, and tablet PCs on the market. For those of you that own a smaller sized laptop and are lacking the efficiency brought along by an intergraded number pad, this wireless keypad certainly is an accessory to consider. With this plug-and-play number keypad at your side, you’ll always be able to efficiently enter numbers and engage in calculations in the fastest possible way. Thanks to its compact and portable design, this number pad can be carried along anywhere you go – allowing you to work at any place and bringing along great on-the-go productivity. This numeric keypad comes with a 12 months warranty, brought to you by the leader in electronic devices as well as wholesale electronic gadgets..